The Shawnee State University softball team swept Georgetown (Ky.) on Saturday to add two notches in their win column for the 2019 season. Portsmouth, Ohio – Shawnee State Softball finished their weekend of games against Georgetown College with sweep of Saturday’s double header. Paige Oldham (FR/Shelbyville, Kentucky) received the nod in the first game of the day for the Bears. Oldham allowed six earned runs on 12 hits with one strikeout. Offensively, the Bears were late to the game but made it well known. In the second inning, Marisa Brown (SR/Liberty Township, Ohio) homered to center field to get Shawnee State on the board. In the sixth, Ashton Rankin (FR/Catlettsburg, Ky)’s single would score Alayna Yates (FR/Vanceburg, Kentucky). The seventh inning is when the Bears showed up and started to take control. With the help of an error, Mo Wolansky reached second base and later scored off Brown’s double. A series of errors allowed three more Bears to score. Shawnee State won in walk off fashion as a wild pitch allowed Mackenzie Riley (SR/Proctorville, Ohio) to score from third base in the bottom of the seventh frame. The Bears exploded with big innings in the second gamr, closing out their day with a sweep of day two. McKenzie Whittaker(SR/McDermott, Ohio) pitched 5.1 innings allowing nine earned runs on 11 hits. Shawnee State would score four runs each in the third, fourth and fifth innings. 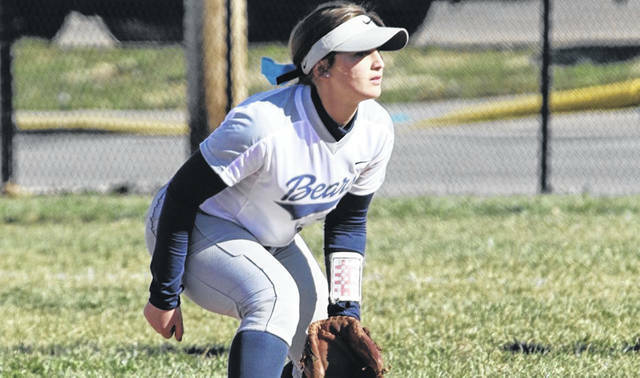 In the third inning with bases loaded, Marisa Brownwould single through the hole at shortstop scoring Megan Shupert-Martin (SR/West Portsmouth, Ohio) as the Bears would finish the inning with three more runs. In the fourth, a wild pitch scored Shupert-Martin before Marisa Brown would clear the bases with a three-run home-run to left field marking her second home run of the day. Maureen Wolansky (SO/Cleveland, Ohio) would double as Alayna Yates scored in the fifth inning and then. Later, Stacy Trenholm(SO/Lancaster, Ohio) would hit a three-run home-run giving the Bears twelve runs for the game, the victory, and the sweep of day two against the Tigers. Shawnee State return on Tuesday, March 26th at University of Rio Grande at 3:00 PM, ET, in a double header.